South Korea's military will greatly increase the number of Hyunmoo missiles in its inventory to better counter North Korea's evolving nuclear and missile threats, sources said Sunday. Government insiders said the military is devising a plan to simultaneously take out missile bases all across North Korea in times of crisis. "To accomplish this, the South needs more ballistic missiles at its disposal," said an official, who spoke on the condition of anonymity. He said that procuring more short-range Hyunmoo 2A and 2B ballistic missiles, which have maximum ranges of 300 kilometers and 500 km respectively, and 1,000 km Hyunmoo 3 cruise missiles can help Seoul "neutralize" Pyongyang's missile threat. South Korean missiles generally have shorter ranges but are much more accurate than their North Korean counterparts. The source said that next year's addition of a new type of ballistic missile to South Korea's arsenal with a range of 800 km will enhance Seoul's capability to cover all of North Korea. 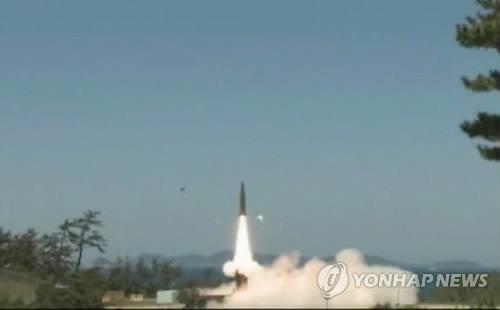 In October 2012, Seoul and Washington agreed to extend the maximum range of South Korean ballistic missiles. The remarks indicate that Seoul is aware that the North may launch its missiles all at once against the South if it starts another war, and that it needs to destroy them before they get airborne if it has advance intelligence of a pending attack. The communist country is known to have some 1,000 missiles it can unleash at once. This pre-emptive strike capability, coupled with South Korea's plan to build a Korea Air and Missile Defense and "kill chain" to detect, identify and intercept incoming missiles, should allow the South to counter the North's asymmetrical threats coming from its weapons of mass destruction. This "triple defense posture" was first mentioned by Defense Minister Han Min-koo on July 11. In a question raised by an opposition lawmaker, the minister said that Seoul is moving forward with its plan and that it has made considerable headway. Seoul's defense ministry has declined to reveal details of the triple defense plan, although it has said that the country is working with the United States to effectively deal with North Korean provocations. South Korea's military has identified three belts of North Korean missiles, with the first belt located some 50-90 km north of the Demilitarized Zone. This belt has 500-600 Scud missiles that have ranges of 300-700 km. It said the North has some 40 transporter erector launchers in this belt. TELs allow missiles to be moved about much more easily, making them hard to detect and destroy. In the second belt lying 90-120 km north of the DMZ, Pyongyang is known to have placed 200-300 Rodong medium-range missiles with a range of around 1,300 km with 30 TELs.